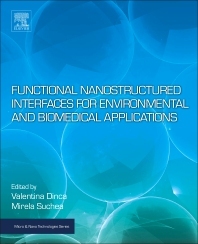 Functional Nanostructured Interfaces for Environmental and Biomedical Applications provides an overview on the characteristics of nanostructured interfaces and their processing technologies for a wide range of applications in the sensing, photocatalytic and bioengineering areas. The book focuses on the fundamentals of multifunctional nanostructured interfaces and their associated technologies, including versatile technologies, such as colloidal lithography, scanning probe techniques and laser nanostructuring, which can be used to obtain multifunctional 2D and 3D nanotextured interfaces. The book provides multidisciplinary chapters, summarizes the current status of the field, and covers important scientific and technological developments made over past decades. As such, it is an invaluable reference to those working in the design of novel nanostructured materials. Dr Dinca is an expert in Thin film deposition by pulsed laser deposition (PLD) and matrix assisted pulsed laser evaporation (MAPLE), laser based methods for biological compounds, natural and synthethic polymers patterning (LIFT), polymer, hybrid surfaces structuring for cell adhesion studies. Dr Suchea has a background in physics and materials technology with particular expertise in photonics and applications of nanostructured materials.